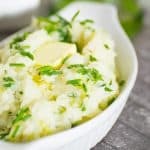 Eating Low Carb doesn't mean missing out on celebrations, and we've got the perfect side to make your St Patrick's Day a little bit green - Keto Cauliflower Colcannon. Cook the cauliflower in a pot of boiling water for 5 minutes, until it is tender. Drain well and blend in a food processor with the salt and pepper. Melt 50g of the butter in a frying pan over medium heat, add the cabbage and saute for 3 minutes. Add the scallions and chives and saute for 2 minutes. Reduce the heat to low. Pour the mashed cauiflower into the pan and mix well. Adjust seasoning. Serve Cauliflower Colcannon with the remaining butter melting over the top.